Talking Carl from Awyse is the digital version of that annoying little brother who copies everything you say in a hilarious voice. But unlike your little brother, you can poke Talking Carl in the eye without getting grounded. 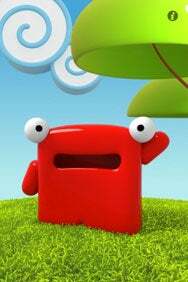 Listening Carl: Say something to the Talking Carl app, and the animated Carl will listen (cupping a hand to his ear) and then repeat what you’ve said in a funny voice. When you launch the $1 novelty app, you’ll see Carl, a cute little red creature, patiently waiting for you to play with him. Ignore him too long and he’ll grumble at you. If you poke him, he screams at you. Say anything, and he intently listens to you with his hand up to his ear, and then repeats it in a funny little voice that’s quite amusing. You can also tickle Carl to make him crack up or pinch him to hear him growl. Carl’s animations are really cute, adding to his charming character. No, the app serves no purpose beyond entertainment. But Talking Carl makes for a good, little distraction and quite a few laughs. The $1 price tag could be an especially attractive deal if you have kids, who are sure to get a kick out of Carl’s verbal and animated antics.